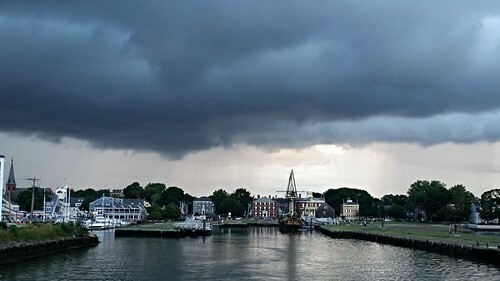 Derby Wharf with the Friendship Tall Ship as a storm moves onto Salem. Every since my wife taught me that the grayish hue between clouds and land in the background was in fact rain, I'm now mesmerized by this idea of being able to see a rain storm without being in it. Thus to be on a boat where it isn't raining and watch the rain to the left and right of the Friendship is pretty cool. I also like this photo because it gets the full space while also capturing the foreboding clouds. This seems like a photo that could be enhanced and made more vivid by being turned into a painting.